The 66-mile Shropshire Union Canal runs from Wolverhampton in the West Midlands to the River Mersey in Ellesmere Port. The canal was built in the late 1790’s. A section of the canal failed in August 2009 – this was on the Shebdon Embankment between Norbury Junction and Knighton Wharf. It was reported that a ‘football sized’ hole in the side of the Embankment caused this section of the Shropshire Union Canal to fail and be closed. This embankment has long been problematical – several areas of the embankment showed evidence of water egress, believed to be as a consequence of ongoing subsidence of the embankment. Over recent years many attempts have been implemented to stem these leaks. Recently sheet piles were installed on both sides of the canal, however this did not prevent water dissipating through the canal bed and out through the sides of the embankment. This culminated in the massive failure seen in August 2009 which led to immediate closure of the canal to effect repair. Several options were identified and reviewed including laying concrete as a base and vertically piling concrete, however these were considered unacceptable for technical and practical reasons. Working with British Waterways a novel approach was proposed which had not been previously tried in such applications. The approach consisted of mixing sediments present in the canal bed in-situ with a proprietary slurry mixture of bentonite and cement using a purpose built soil mixing rotary cultivator on the end of the boom of a 30 ton digger. The resultant mixture was allowed to cure and be re-worked; the mixture was designed to produce a bed material as similar as possible to the original puddle clay. 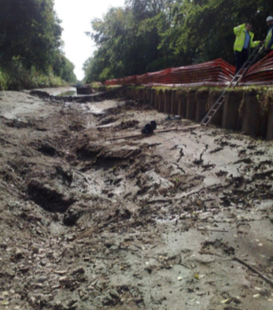 The aim of the project was maintain as much of the existing canal bed as possible and improve the geotechnical properties of the silt and detritus on the canal base to form a flexible yet strong and impermeable barrier to minimise the effects of future subsidence associated with the canal embankment. Envirotreat contributed to the design of the additives on the basis of their experience in designing and constructing low permeability soil mixed barrier systems and ECO undertook the implementation utilising their extensive soil mixing experience.